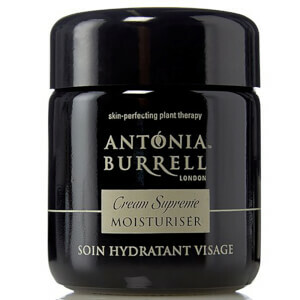 The Antonia Burrell Cream Supreme is a 100% natural anti-ageing moisturiser. The cream helps to reduce the appearance of imperfections whilst improving the appearance of your overall complexion. The moisturiser helps to regulate sebum production whilst reducing hyper-pigmentation, acne and redness. Your complexion will be left clear of acne and dark marks. Thanks to the anti-inflammatory properties skin will be left soothed whilst the anti-ageing properties reduce the appearance of wrinkles and fine lines. The powerful yet gentle formula is made up of a number of natural ingredients which are kind to skin. The Anti-Acne Complex and the Amazonian patented bio actives work with oily skin in order to find the perfect balance between hydration and oil production therefore making areas of acne less prominent whilst the patented olive leaf extract soothes and calms areas of irritation. The moisturiser not only works to control imperfections but it also keeps the skin protected from any external aggressors such as UV rays and free radical damage as it is infused with larch extract and mango seed, rich in antioxidant vitamins A, C and E. In addition, all of Antonia Burrell’s range contains violet grass which helps to preserve natural ingredients therefore prolonging the life of her products. Accelerating the skin healing process, the Antonia Burrell Cream Supreme will leave your skin with a healthy, radiant glow. A.B. Massage the Antonia Burrell Cream Supreme into your skin after using your preferred toner.